The MEWSS is U.S. Marine Corps' ground component of the Intelligence and Electronic Warfare Common Sensor (IEWCS) system. It uses the same subsystems as the Army's Ground Based Common Sensor-Light and Heavy( GBCS-L &GBCS-H), and the Advanced Quickfix ( AQF). 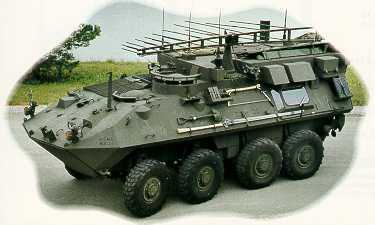 The MEWSS uses the Light Armored Vehicle (LAV) as its platform. The MEWSS is capable of intercept and location. It is also capable of conducting surgical electronic attack against designated targets.The MEWSS is operated in the USMC MAGTF area typically at or beyond the FLOT. The most notable example of IEWCS technology transfer is to the U.S. Marine Corps (USMC) in an electronics suite upgrade to the Mobile Electronic Warfare Support System (MEWSS), known as the MEWSS Product Improvement Program (MEWSS-PIP). This upgrade utilizes all three IEWCS subsystems configured in a standard Light Armored Vehicle, to become in essence a fourth IEWCS platform configuration. The direct use of open system architecture [OSA]-based IEWCS technology in the MEWSS-PIP acquisition has provided the USMC a cost avoidance of approximately $149 million to $481 million, depending on the specific cost avoidance baseline assumptions used. Minimum turn diameter 51 ft. Maximum trench crossing 81 in.